The past couple months I've been doing a lot less cooking and a lot more throwing together edible ingredients. When I have cooked, it's been a lot of variations on the same quick and easy meals. I like to think of meal planning as "meal preparedness." I think it sounds a little less intimidating. When most people think meal planning, they imagine pulling out a calendar and planning exactly what to eat each day. For some, that level of organization works, but I find for most, it interferes with one's ability to make intuitive decisions about what to eat. Plus, it's a whole lot of time that goes into cooking according to a recipe, especially a new one. For me, meal preparedness involves having a new recipe or two to try out, then a well stocked pantry and refrigerator that allow me to throw together meals with what I have. Here's some of my favorite recipes and ideas for quick and easy meals you can make with a well stocked pantry. Typically I have less of an appetite in the morning, so a slice of toast with a fried egg is pretty typical. 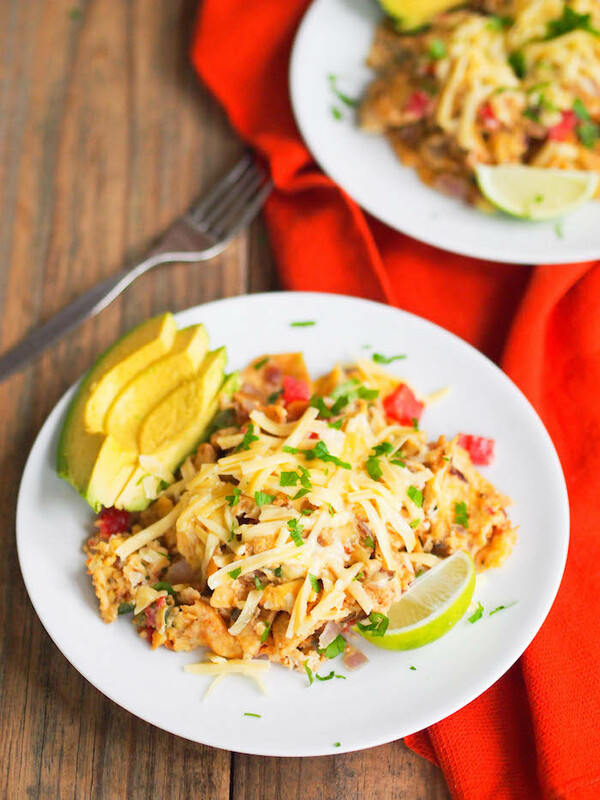 I also love to cook migas, since we always have tortilla chips on hand. You don't need to follow the recipe I linked perfectly. Often times, I'll just crisp tortilla chips in a skillet, add the beaten egg, then top with a little cheese and salsa. When I make oatmeal, I always make a big batch so I can heat it up later in the week. Lately I've been eating my matcha coconut toasted oat bran bowls and coconut steel cut oats with dark chocolate. I almost always cook oats with canned coconut milk because it tastes better and it is much more filling with all those yummy fats. To reheat oatmeal, just add a little water for liquid before microwaving and it will loosen right up. Trader Joe's sells frozen latkes that I'm obsessed with. I cook 2-3 and top with smoked salmon and a dollop of plain yogurt. Sometimes I'll have a fried egg or fruit on the side if I'm hungrier. Fried rice is another breakfast favorite of mine. Often I'll cook extra rice so I've got some on hand for breakfast. I might chop up a little onion or whatever leftover vegetable is in the fridge, stir-fry it in sesame oil, then add cold cooked rice and continue to stir-fry until the rice is hot and crispy. Push the rice to the sides of the pan, scramble an egg in the middle, then stir it all together. I season mine with a dash of soy sauce. If nothing sounds good in the house, I'll swing by Earth Fare on my way to the office and grab a microwave breakfast burrito or eggs and potatoes from the hot bar. I'm also partial to breakfast sandwiches from Drip, but if I'm really in a rush, Earth Fare is much quicker. This section is easy for me, because it's almost always LEFTOVERS! I mean, can you think of anything quicker and easier than that? If we don't have leftovers, or if those leftovers aren't calling my name, I'll just get takeout - usually a grain bowl from Rosewood Market or Jamaican from Island Grill, my two current favorites. I also like to keep frozen meals on hand for quick lunches. I pair them with fruit and/or yogurt, and often will top it with avocado or fried egg or cheese (depending on the meal) to make it more filling. For a lot of my clients, throwing together tons of different snacks foods works well as a quick lunch. They might pair a packet of tuna mixed with mayonnaise with crackers, fresh fruit, hummus, and some yogurt. Or rice cakes topped with guacamole, sliced cucumbers, and feta served with string cheese, fresh fruit and some trail mix. Basically, if it's got some fat, protein and carbohydrate, and it's enough to make you feel satisfied, who says it has to be "meal" food. Another lunch I often make are store bought pureed vegetable soups. I love Pacific's (client) curried red lentil and garlic and potato, and Trader Joe's creamy black bean soup. I warm them up and stir in additional ingredients to make it more of a meal. For the red lentil soup, I might stir in some baby spinach and top it with avocado. For the garlic and potato soup, I might top it with shredded cheddar and olive oil crisped bread croutons. I use the creamy black bean soup to make a tortilla soup with tortilla chips, sliced tomatoes, avocado, feta cheese, and tons of fresh cilantro and scallions. This brown rice, roasted broccoli and chickpea bowl has long been one of the most popular recipes on my site, even before I updated it with semi-decent images. Use canned chickpeas, reheated frozen or 60 second brown rice, and roasted broccoli from meal prep, or another roasted vegetable. Try Trader Joe's roasted Brussels sprouts or get grilled/roasted vegetables from your grocery store deli. The mustard-soy dressing takes less than two minutes and is SO delicious. Lately, I've been really into sheet pan meals. My recipe for sheet pan ratatouille chicken is as easy as can be, and I've also made these recipes for sheet pan garlic ginger chicken (made with tofu), sheet pan harissa chicken and sweet potatoes, and this sheet pan miso salmon and green beans. This recipe for baked eggs and tortillas is one of my favorites. The main ingredients - tomato sauce, tortillas, eggs, and cheese - are all things I usually have on hand. Pro tip: I also made this recently with refried beans and black olives spread into a layer and it was SO good. Pasta is always a favorite dinner of mine. Lately, I've been really into lentil and chickpea pastas. Because they're made with beans and therefore are naturally high in protein, it makes it really easy to prepare a complete meal. Often I'll just toss it with roasted vegetables and tomato sauce. Or, I might toss it with pesto (try my spicy jalapeno pesto), cherry tomatoes and serve it over a bed of greens, topped with crumbled feta or goat cheese. 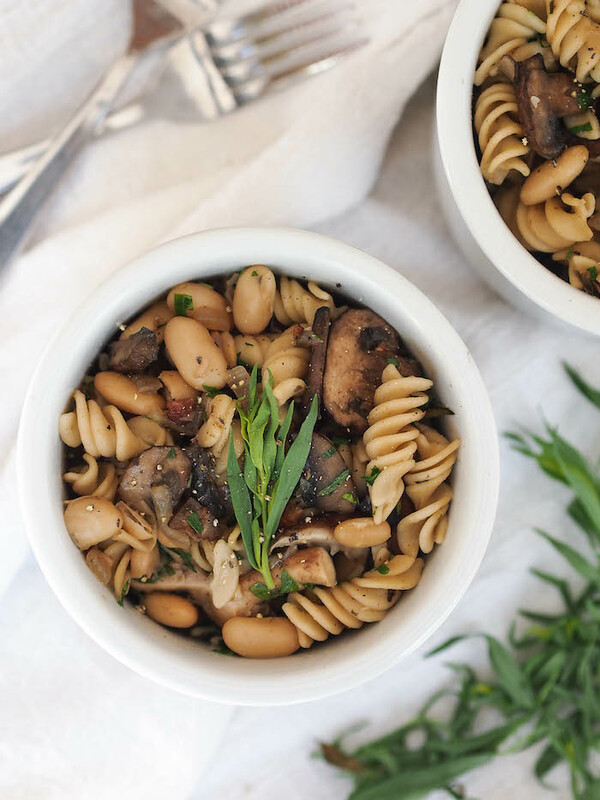 Another favorite quick and easy pasta recipe is my simple mushroom and white bean pasta, which is a (slightly) upgraded version of the recipe that got me through college. Frittata for dinner is another quick and easy favorite of mine. I rarely follow a recipe - just saute vegetables in an oven-proof skillet, add beaten eggs and cook until most set, then finish cooking with a quick spin under the broiler. I like to add frozen, shredded potatoes so there's a source of carbohydrate. What's great about frittata is that leftovers make a yummy breakfast too. Try my recipe for smoked salmon and goat cheese frittata with capers and dill. Would love to hear your favorites! Always can use some more inspiration for easy dinner ideas. Leave a link or comment below.